Say goodbye to dull, tarnished metal surfaces! 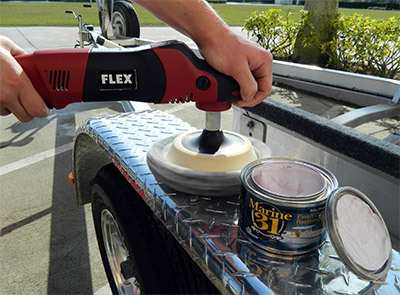 Marine 31 Finish Cut Metal Restoring Polish utilizes an advanced abrasive that is designed to remove oxidation and staining without dulling the finish. �With a few quick swipes of an applicator your boat�s brightwork will look better than new.� What�s more, Marine 31 Finish Cut Metal Restoring Polish contains an anti-corrosive agent that protects the finish after you restore it! 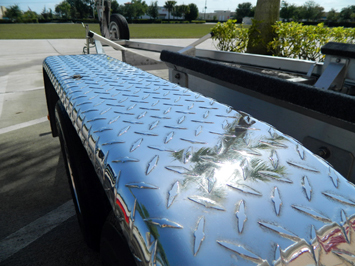 Marine 31 Finish Cut Metal Polish is harbor safe and eco-friendly. Ensure surface is clean and cool to the touch. Not intended for clear coated surfaces. Apply a small amount of polish onto a terry cloth applicator and thoroughly work the polish into the surface until it is clear and glossy. 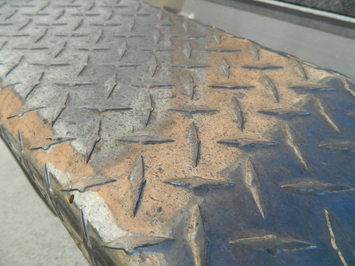 For drill/polisher application, use a wool pad and follow the same application method. Simply the best polish on the market for boaters that are looking for a professional showroom shine for there trailer. Cuts through the "skin" of the aluminum to achieve a brilliant high gloss look. Use the polish afterwards to maintain the look between uses. I have lived in Fl for 50 yrs, and used them all. You will not be disappointed with the performance of Marine 31 products. When I pull into a boat ramp / gas station people are blown away of the super high gloss look of my double PWC trailer. "How do you make your trailer shine" is that trailer new? No, I use Marine 31. Can't find it in any boat store, not sure why, West Marine has never heard of it! ProsThe best product on the market....Period! ConsWear gloves to protect hands don't not wash rags in your wife's washer....she will kill you! I've been polishing bare aluminum for years and love testing products out so I've used many and lot's of side by side comparison's. Been detailing auto's for years and just got into detailing houseboats, doing one right now that is around 20 years old and the aluminum railing really hasn't been takin care of and as you can imagine it's pretty bad, the railing's look like old fence post. I tried 3 or 4 different products and was getting great results but was taking way to long. Talk to Mike Phillips and told him what I was using and outcome and he reccomended Marine 31 Finish Cut Metal Restoring Polish. So I ordered, got in and WOW!!! This stuff cut my work time down in half even over buff magic's polish. This stuff works and finishes off amazing. Leaves a mirror shine behind even on badly oxidized bar aluminum. ConsHaven't found nothing yet and have used on over 360 feet of aluminum railing.